Nellim, village of the wilderness, is calling your family. Make your way to the north-eastern corner of Finland and find it on the shores of Lake Inari – a glorious body of water with over 3,300 islands. 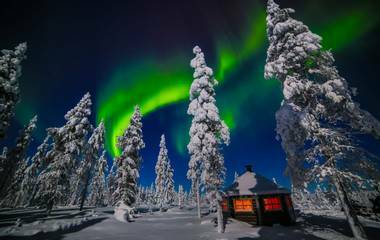 Just five miles from the border with Russia, it’s a short distance from the Vätsäri Wilderness area and its quiet environment of forests and rocky stretches: a land of owls and Arctic foxes. The nights are animated by the Northern Lights; the afternoons are blue with polar sun. All in all, Nellim is an outdoor treasure and an exquisite activity destination! As well as Finns, two other Nordic peoples have made Nellim their home: the Inari and the Skolt, both members of the native Sami community. Everyone will fall in love with their customs and traditions, chief among which is reindeer herding – possible to see at any of the numerous farms close to the village. Based at the Nellim Wilderness Hotel, you can spend your days skiing, trekking, and on safari in the nearby areas; back in your roomy accommodation, you’ll have the option of overnighting in the innovative on-site ‘Aurora Bubbles’: cosy glass igloos where you can watch Nature’s show in the sky before counting stars instead of sheep! Whether you’re jumping into natural playgrounds or soaking up Sami culture, there’s plenty to do on our Nellim holidays! Bearing in mind that the hotel is right next to some of the richest wilderness habitats to be found in the country, we waste no time in getting you familiar with it. A guide will accompany you on survival skills excursions where you can learn the essential arts of starting a campfire, assembling an igloo, and fishing on the ice. You’ll soon be masters of the outdoors! As Nellim is situated in exceptional territory for viewing the Northern Lights, you will of course be taken out to try and spot them. Our regional experts know the very best hotspots where your family will have the optimum chances of making a sighting. There’s fast fun to be had on snowmobile safaris and cross-country skiing courses, both of which can be enjoyed on our holidays here. Full instruction will be provided to ensure that you can safely and skilfully take part in these Nordic pastimes. Best of all are dogsledding trips, with tireless huskies drawing you through open spaces and over the top of frozen Lake Inari – there’s nothing quite like them! You’ll also visit a Sami reindeer farm and get close to these marvellous creatures, on top of learning about the age-old practice of herding. It’s a wonderful attraction on any of our holidays, but makes for an especially festive treat on our Christmas Nellim trip! It was at Nellim that many of our own team saw the Northern Lights for the very first time, so it holds a very special place in the hearts of the Activities Abroad office! Staying in an Aurora Bubble is utterly spellbinding: you’ll be gazing through a window into another world. And, that’s just one example of many great Nellim experiences you might have – learning how to build an igloo out of snow during a wilderness skills session is another, and is simply brilliant! Snowmobiling through the outdoors is high-octane excitement. It’s a common way of getting around in the Nordic countries, so you can imagine how much fun people in Finland must have on a daily basis – beats sitting in traffic any day! Husky rides are better still, and the dogs make fantastic companions for the whole family. As for Sami companionship with reindeer – it’s a beautiful relationship to see for yourself: one which has lasted for thousands of years. The Nellim Wilderness Hotel is run by a friendly local family, which means that the whole site has a noticeably personal feel. Such warm hosts and a welcoming hotel atmosphere – not to forget the hearty buffets in the dining area – recommend it very highly indeed.